Companies also are gorging on massive amounts of data collected on our spending habits. New York • Restaurant chains are making it easier to order food with a few taps of the screen — so much so that you may lose sight of how much you're spending. The convenience that technology offers may make us less vigilant about how much we're buying. Digital ordering also lets companies better track our spending habits, and may lead to increasingly personalized offers that are more likely to catch our attention. Digital ordering helps you find more of the things you want, but it's worth understanding the other side of the equation: Sometimes, technology is an opportunity to get you to spend more. Domino's • About 60 percent of Domino's orders now come through the chain's website, app and other digital channels. And people tend to order more online than over the phone, says Domino's spokesman Tim McIntyre — likely because they can browse the menu and take their time deciding. That can result in people getting another pizza topping, or adding sides. "They tend to upsell themselves," McIntyre said of online customers. Domino's also has prompts during the ordering process. Once a pizza is ordered, for instance, people might be asked if they want to "cheese it up," or add drinks near checkout. Employees taking orders by phone are also encouraged to suggest extras — a tactic known as "upselling" or "suggestive selling." But McIntyre says the human attempts aren't as consistent. "The computer never feels rushed, the computer never feels rejection personally," he said, noting that some employees might be shyer than others. 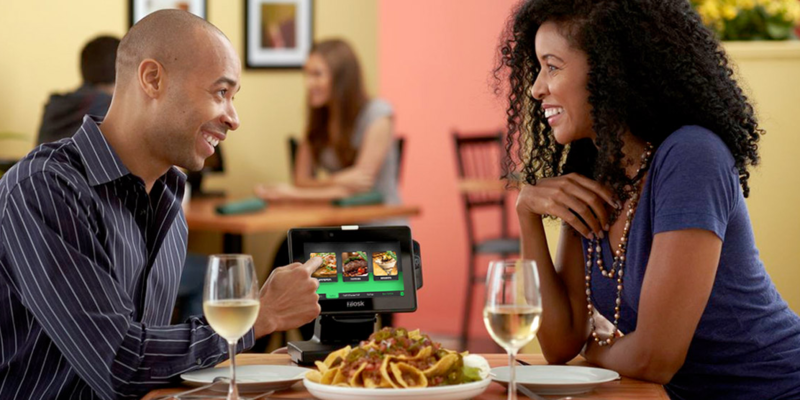 Chili's, Olive Garden • Tabletop tablets being used at some sit-down restaurants, which let people order food and pay for their meals, can have a similar effect. Ziosk, the company that makes the devices available at chains including Chili's and Olive Garden, said restaurants see more orders of dessert and appetizers with Ziosk devices. Dessert orders also tend to have more coffees attached to them, said Ziosk CEO Austen Mulinder. "The Ziosk will always remember to ask, 'Do you want to add coffee to that?'" he said. Chili's has cited other benefits of Ziosk, including the collection of customer spending data. The devices also generate money from games that people can play while waiting. That revenue more than offsets the cost of the devices in most cases, Mulinder says. Starbucks, Panera • Starbucks is pushing into more personalized offers for loyalty members and mobile app users, which include the recent rollout of "real-time" suggestive selling based on past purchases for people ordering ahead on their smartphones. The company says the efforts are yielding positive results, with spending by loyalty members up by 8 percent in the latest quarter. "We think that the steps we've taken regarding personalization are a driver of that," spokeswoman Maggie Jantzen said. The company has also been turning the acquisition of reward points into games. That includes ones like "Starbucks Bingo" that reward members for making particular purchases. Panera's loyalty program also incorporates members' past purchases. Unlike in most programs, Panera loyalty members do not know when they'll get their next reward, or what it will be. Blaine Hurst, Panera's president, says customers can be placed into one of "thousands" of rewards tracks based on their spending habits. If their spending habits change, they can shift into different tracks.